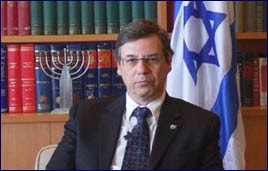 Below is the message of Deputy FM Ayalon to the Iranian people. The Iranian reactor constitutes a tremendous danger to the stability of the entire region and to world peace in general because, besides nuclear armaments, Iran is also developing a missile system that threatens countries beyond the Middle East, such as Europe. Nuclear weapons in Iran's hands will enable it to threaten all the Arab governments with its present means (subversive elements in various countries, agents, and so forth). Even now it controls bodies that function as a state within a state, in Lebanon, Yemen, the Palestinian Authority, and other places. Another point that does not always come up in the Iranian context, due to the nuclear threat, is the glaring violation of civil rights inside Iran. This is an aggressive dictatorial regime, and all progressive elements throughout the world should take action against it, if only for that reason. Israel congratulates the Iranian people for their efforts to liberate themselves from the burden of the oppressive regime. At international forums, Israel has raised the issue of the suffering of the Iranian people and the cruelty of the regime ruling them. That is the main thing we can do for such an illustrious nation suffering from oppression. But in the end, it is the Iranian people themselves who must take their fate in their own hands and act to achieve their rights. The more the citizens of Iran increase their protest activities, the higher the international support will be." In response to a question regarding the likelihood of regional war, the deputy minister replied that :"There is always the possibility of sudden, unplanned deterioration due to one action or another. Israel is committed to defending its citizens and if attacked will act accordingly. A fear exists that Iran - as it becomes more pressured by sanctions - will goad those under its patronage in Hizbullah and Hamas to initiate military action against Israel. There's also a possibility that Iran will make a military move against the Arab Gulf states and harm the flow of oil to the world, in which case the entire situation will degrade into widespread confrontations. Remember that the sanctions are aimed against Iran's efforts to arm itself with nuclear weapons, and if they don't elicit results, the United States and other nations might consider other options."